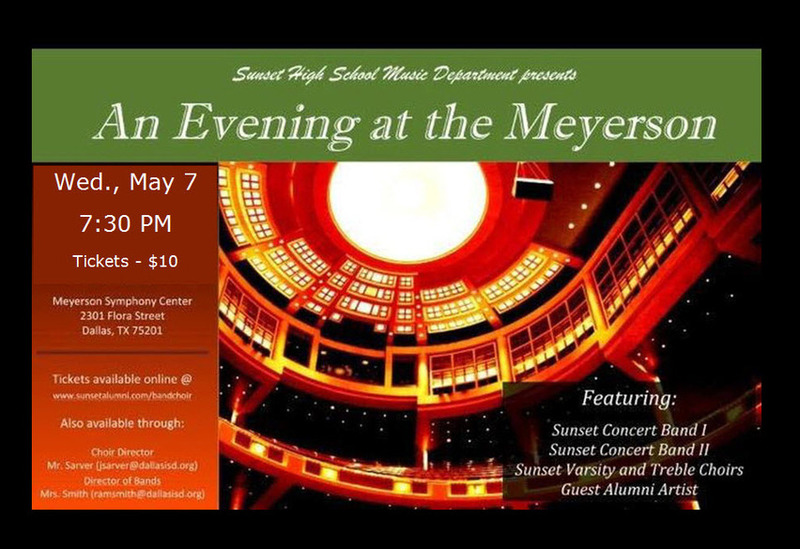 Come join a wonderful evening of music and song with Sunset's band and choir at the 2nd Annual Evening at the Meyerson Symphony Hall. Tickets may be purchased on line via PayPal or at the door for $10.00 per person. Note: If you would like to advertise in the program please contact: Jon Sarver, jsarver@dallasisd.org or cell 214.207.2641 for more information or complete the form below and return to Jon. Special thank you to Alumni Les Studdard, Class of 1963 and General Manager of the Meyerson for helping our students teachers to make this event a success! All tickets may now be purchased at the door on the evening of the performance.